You haven’t played a Mario vs. Donkey Kong game in a while, and you desperately want to. You’re a die-hard fan of Nintendo and the Mario vs. Donkey Kong series in general. At this point, you probably know what you’re getting into when you play a Mario vs. Donkey Kong game. Ever since March of the Minis, the series has focused on puzzle-solving gameplay based around adorable toy versions of Mario characters. Most subsequent games, then, leveraged the strong fundamentals of March of the Minis without iterating on them in meaningful ways, and for better or worse, that’s exactly what players get with Tipping Stars: a game that reasonably fun and thoroughly unambitious. As far as I’m concerned, there’s no plot to speak of, so it’s all about the gameplay here. Much like its predecessors, Tipping Stars tasks you with guiding toy versions of Mario, Peach, Toad, and others to the goal doors of each level. You have no direct control over the toys, so you’ll need to interact with the environment to get them there: drawing in platforms, placing springs, manipulating conveyor belts, the list goes on. Along the way, you can pick up coins and medals for extra points, and you can grab additional platform or conveyor belt pieces as well. If you can successfully usher all of the toys to the exit, you move on to the next stage. Rinse and repeat. The core mechanics work well, much as they have for years now, and some of the later puzzles are really enough to get you thinking, but Tipping Stars simply doesn’t innovate enough to impress, even if you haven’t played a Mario vs. Donkey Kong game in a few years. The most you’ll get is a headcrab-like zombie monkey that curses one of your toys and actively makes it your enemy until you can defeat it. Other than that fun new twist, there’s little here that we haven’t seen in previous games. It’s still fun to test your mettle against the game’s ever-expanding arsenal of tricks, but the whole experience suffers from been-there, done-that syndrome. If you’ll allow me to get on my soapbox for a moment, I have to say that I miss the days where players had some degree of control over these characters. Though it keeps you on your toes, it can get a little frustrating to pretty much always have your toys on the move. Since there’s no way to speed them up, you’ll occasionally need to just sit there and watch them slowly meander toward the goal with absolutely nothing standing in their way, and that gets irksome as well. That’s not to say Tipping Stars is bad or inherently flawed; the characters’ forced movement does occasionally necessitate some creative approaches to puzzle-solving, but I can’t say that I prefer this over, say, March of the Minis. Different strokes, I suppose. At any rate, once you’re bored of the main stages, I highly recommend the game’s Workshop mode. Here, the level editor makes a triumphant return, and it’s as addictive as ever; admittedly, this is where I spent most of my time with the game. Starting with nothing but a blank canvas and your imagination, players can leverage pretty much all of the game’s assets in service of building the craziest, most thought-provoking levels they can. As you collect more stars, you can buy and unlock more items and characters to use, though some of the special objects require some insane dedication to acquire. Thankfully, you can’t simply buy these items with real money, so you’ll need to actually play the game to unlock everything. Admittedly, this may annoy those who simply want carte blanche access to absolutely everything right from the start, but it does add some additional incentive to keep playing. As usual, once you build a level you’re happy with, you can hop online and share it with the world. You can, of course, also download levels other players have made; they range from no-effort star-generators to genuine head-scratchers and everything in between. 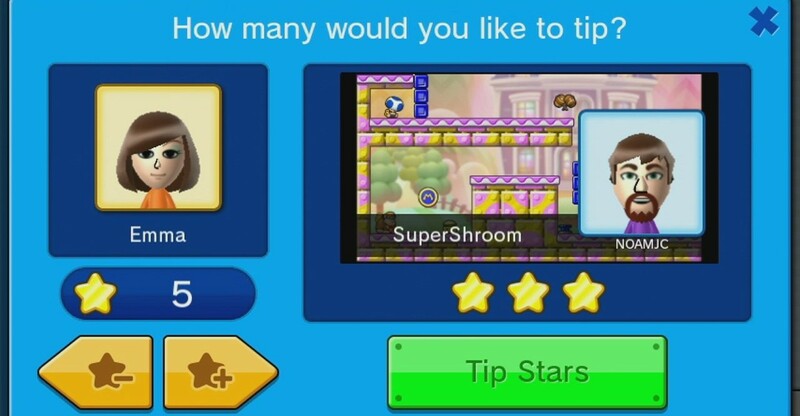 If you end up really enjoying levels that a certain player has made, you can reward them and encourage them to make more by tipping them stars from your stockpile, which is obviously where the game gets its name. There are already lots of player-made levels waiting to be discovered, and Nintendo has hundreds more coming straight from the game’s developers, so there’s definitely no shortage of content to explore. Though it’s clearly not the focus of the game, the overall presentation doesn’t offer much; though no recent Mario vs. Donkey Kong has wowed me in this regard, Tipping Stars really feels like it’s coasting here. The high-definition assets, while simple, look nice enough on Wii U, though the fact that you’re essentially forced to play on the GamePad dilutes their appeal somewhat. The 3DS version suffers from pared-back and more jagged graphics, but the style of the game shines through regardless. Music and sound effects are cutesy and inoffensive, with bog-standard remixes of familiar tunes providing most of the aural entertainment – again, serviceable, but nothing special. I mention both versions because, in a first for Nintendo, the game supports cross-platform purchases on both 3DS and Wii U, so buying Tipping Stars on one platform nets you a download code for the other. Though this is probably something the company should have pursued by now, it’s really nice to have the feature present. Unfortunately, your progress doesn’t seem to carry over across the two versions, so you’ll essentially need to do everything twice to unlock all of the content on both platforms; outside of the awesome level editor, the game just isn’t fun enough for me to want to do that. Perhaps that’s the best way I can describe Tipping Stars – fun, but not fun enough. The cross-platform support is a step in the right direction, and the community-based level sharing is still pretty addicting, but nothing really makes the game stand out. The core gameplay still holds up, and you’ll probably get a lot of mileage out of it if you’re a diehard fan, but it likely won’t amount to more than a quick, time-wasting impulse buy for most people, and at a rather steep $20, this really isn’t something you’d buy on a whim.